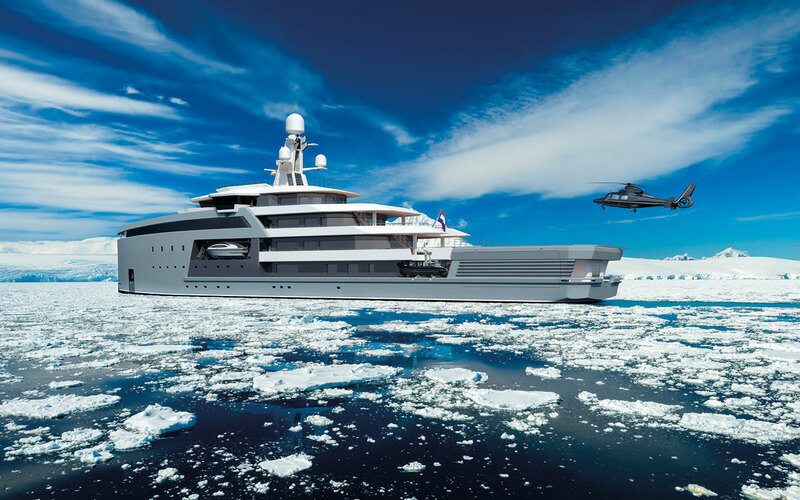 A product of a unique design partnership between Damen shipyard, Azure Naval Architects and EYOS, the SeaXplorer is the world’s first globally capable, Polar Code compliant expedition yacht. The SeaXplorer range — available in 65, 90 and 100-meter designs — was unveiled last September at the Monaco Yacht Show. The quick turn around from unveiling to sale shows the increasing interest in taking yachts beyond the traditional cruising grounds of the Mediterranean and Caribbean. Working with Damen, EYOS introduced over 150 design criteria to be incorporated into the yacht. The result is the first expedition yacht with input from in-the-field practitioners, ensuring her guests will be able to maximize their experience in the most remote and wild regions on Earth. To be able to reach far flung destinations, the SeaXplorer offers 40 days of autonomy without port call and complies with the stringent new environmental and safety standards in the IMO Polar Code’s B category. Equally at home in the polar regions and the tropics, a fully enclosed helicopter hangar and accommodation for the most advanced submersibles available allow for exploration far beyond traditional boundaries. Ultimately, the SeaXplorer combines proven capability where you need it and superyacht luxury where you want it. ‹ Justin Hofman’s photo is the National Geographic Photo of the Day!